Eleanor woke up with a start. Across the other side of the room Maighread cried out in alarm. The chamber door lay open and Ragwulf stood in the doorway, a flaming torch in his hand. Eleanor slid out of her narrow bed in a hurry, only remembering her nakedness when she found Ragwulf staring at her. She snatched up a linen shift and her servant, Becky, scrambled up from her place on the floor to help her dress. “Go on, I’ll come after,” Eleanor told Ragwulf. “Is it the same ones?” she asked. “God alone knows. They’re all thieves and murderers - every last one.” His voice was gruff, dismissive. Ragwulf left and the chamber was plunged into darkness with Becky still scouring the floor for clothing. Once dressed, Eleanor bent down to rummage under her bed. “Where’s my sword?” she growled. When she stood up and her eyes adjusted to the poor light she saw that Becky was holding it out to her. Without a word she snatched it and crossed the room to the other bed where Maighread was sitting up. Eleanor shrugged and then hurried after Ragwulf. She ran down the steps to the Hall where the young men had been rudely awoken and were only now arming themselves. Outside in the courtyard she found a short queue of men and women forming at the well. This night’s struggle, like all the others, would be fought with water as much as steel. She could already see the glow of the flames snaking up the outside of the gates. Soon acrid smoke would spread across the yard and they would all be coughing in the midst of it. Their captain, Sir Stephen, was on the wall rampart above the gate, bellowing orders into the night. Young Hal was there too with his bow trained on the ground below; but on the fringes of the fire the attackers would be little more than wraiths. A slight figure came to stand beside her and she gave him a smile. Fulk was the youngest of the men at arms and not really a man yet - just a boy. He had attached himself to her before and regularly pledged to protect her, should the gate be breached. Her smile dimmed and instead she gave him a solemn nod of encouragement - one warrior to another - his courage deserved that much. Bales of burning straw thudded against the gate and the fire burned ever more fiercely. Her hand clenched and unclenched on the hilt of her sword. She did not expect to be using it much if the attack followed the same pattern as before. Whilst the defenders fought the fire, sporadic volleys of arrows fell upon them, usually harmlessly. Wailing cries assailed them from beyond the walls and every so often a crudely-fashioned spear landed on the cobbled yard. Eventually the fire would be extinguished by pail upon pail of water and then, around dawn, it would all go quiet. They would stare at each other in relief, wipe the smoke from their faces, rest their weary limbs and wait for the next time. But Eleanor was wrong; it did not play out as she expected. The arrows did not fall harmlessly. One tore through Fulk’s neck and the impact threw his body against her. They hit the ground hard together and Eleanor rolled into a crouch beside him. Fulk was trembling with fear and pain but she could find no soothing words to calm him. The wound hardly bled at all but the arrow was lodged in his throat and she dared not pull it out. It took a long time for the lad to die and whilst he lay dying she stayed with him, her hand on his shoulder and her eyes locked on his. Afterwards, she did not want to move and instead sat on the cobbles watching the servants and men at arms hurl more water against the gate - until it became clear that this time their efforts would be in vain. The fire at the gate had caught hold and their few leather buckets and leaky wooden pails proved insufficient to put it out. It seemed that tonight their attackers were trying harder for the gate was now a mass of flame. Ragwulf was gathering a line of men at arms across the gateway. She sighed, laid Fulk’s head gently down upon the stones and got to her feet. She moved awkwardly, her legs stiff with cramp, and went to stand beside Ragwulf. He gave her a cursory glance and said nothing, but then she was used to that. There was noise enough with the howling voices outside the walls and the crackle of burning timber within. Something crashed against the gate, now wreathed in smoke. It shuddered and sparks exploded into their faces. Eleanor took a pace back, the air ripped from her lungs. Sucking in a deep breath, she only choked on cinders. She tried not to swallow, spitting out the ash, her throat as dry as old leather. The men were no better off than she and staggered back from the flames, coughing and spluttering. More water was tossed against the gate, but the fire on the outer timbers was too strong. Another great blow battered the gate and a blast of heat struck her in the face, forcing her back a further step. A moment later the flaming timbers split apart and bright shards of red hot wood spiralled out at them. Eleanor drew her sword, Will’s sword, from its worn leather scabbard and cast the scabbard aside. She took up guard beside Ragwulf with her blade raised high above her head. “We can manage well enough without your help, my lady,” he said without a glance at her. The centre of the gate disappeared in a confusion of smoke and flame and through it hurtled several screaming figures. At first Eleanor thought the men themselves were on fire but their spears thrust hard and their axes hacked away the charred timbers. The point of a spear darted at her through the smoke. She chopped her blade down upon it, leaving only a broken shaft. The wild man holding it fell upon her with a snarl and slashed down at her with his long knife. Unable to raise her sword fast enough, she screamed in frustration. Suddenly she was shoved aside and the knife carved only through smoke-filled air. A great axe thudded into her attacker’s body and his savage cry died with him as he fell. “Then keep out of my way!” she barked at him, furious, and knowing he was right on both counts. As the remains of the gate blazed in front of them, they fought in a confused melee and soon it was hard to tell friend from foe. How many men came through the gate she had no idea, but few went out again. She was on the edge of it, skirting the great tangle of men and steel, and choosing her targets with care. She stabbed at a leg or sliced an unprotected arm to the bone until the slaughter ceased and all that remained was the smouldering wood, dying flames and mortal cries. She looked about her: there were bodies aplenty by the blackened gateway and in the yard, including some of their own. At first she could not see Ragwulf and her anxious eyes scoured the courtyard until she found him, leaning against the well. He was breathing heavily, coughing from the smoke he had taken into his lungs during the fight, but he looked unharmed. Though he glowered at her, she patted his arm and smiled before leaving him. When she joined Maighread, Becky and several others in the Hall, she found the long tables already covered with blood-soaked bodies. Her aunt nodded to her but Eleanor decided there were enough helpers and turned away. She wandered back out into the dark to recover her discarded scabbard. At dawn Eleanor and Becky went up to the highest rampart the castle offered at the very summit of Crag Tower. They stared out across the valley to the north where several spirals of smoke twisted up until the brisk wind seized upon them and scattered them eastwards. So, there had been other attacks in the night. “I will go mad here,” said Eleanor. The breeze was cool but they did not mind for it discouraged others. Eleanor would have stood out in the pouring rain if it meant she could find some privacy, and a little peace. The door up to the rampart swung slowly open and Lady Maighread Elder stood in the doorway. She smiled, or at least the left side of her face did whilst the other half, ravaged years ago by fire, merely creased awkwardly. The breeze caught her copper hair and threw it across the scarred cheek. “God give you good morning too, Eleanor,” said Maighread. “No, we couldn’t,” replied Eleanor, turning away. Looking at Maighread's tarnished beauty was more than she could bear. Instead she returned to looking out over the North Tyne, watching it flow in its great curve to the northwest. “So are we all.” Eleanor knew her voice was cold and regretted it at once. “I’ll leave you then,” said Maighread quietly. Her aunt was always so generous to her but fair words often grated in her ears. Maighread did not deserve her hostility but she received it nonetheless. It was not Eleanor’s fault that they were all thrown together in this way, yet she knew it was not Maighread’s either. For a time the three of them stood together looking out over the battlements, silent as the stone. 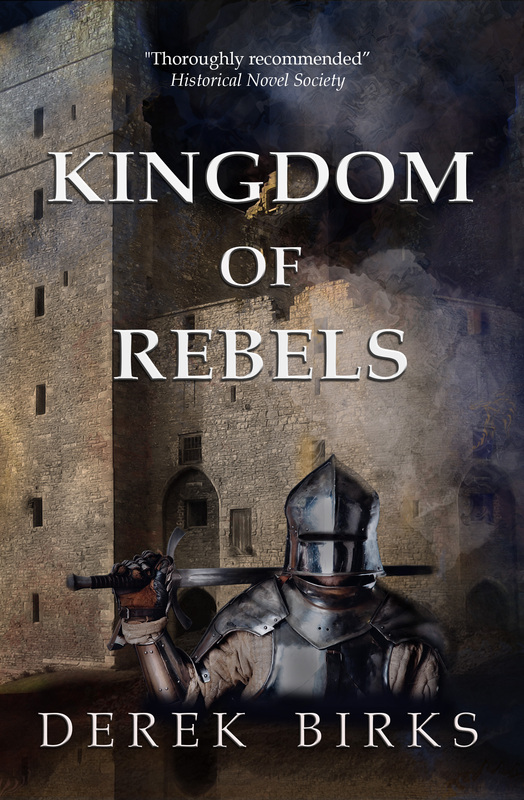 Then the door slammed open and the garrison commander, Sir Stephen, tramped up to them. “Oh, good Christ!” exclaimed Eleanor and pushed past him to descend the steps to the chambers below. Becky smiled an apology and ran after her. Maighread sighed in disappointment. Despite all her efforts to get to know her niece, they remained strangers. Sir Stephen gave her a sympathetic nod. “I'm afraid the Lady Eleanor can be a fickle friend,” he said. Maighread winced. Another year? Could this man not see what was happening around him? “We’ll not survive another year like the last,” she said in a low voice. “Oh, he’ll come here, my lady. I’ve no doubt of that.” Sir Stephen gave her an awkward smile. There was a sudden outburst of shouting from the courtyard below. “Oh, God rest us - what now?” muttered Sir Stephen. He excused himself and hurried down the steps. Maighread tried to see over the parapet but whatever the commotion was, it was out of her line of sight. She did not follow Sir Stephen but sat down on the stonework by the rampart wall. She closed her eyes and put her hands over her ears but still the shouts echoed up towards her. She knew what was happening - it was not the first argument amongst the men and there would be many more if nothing changed. In a moment it would stop and either Sir Stephen or the dependable Ragwulf would harangue the younger men involved before devising some utterly pointless and menial punishment. Well, this time they could at least be put to work on repairing the gate. Then peace would reign… until the next time. She took her hands off her ears but still the shouting continued. She began to pay more attention to the voices for this argument sounded somehow different. The voices were not just loud they were hurling harsh, unforgiving words. A chill went through her as she recognised them: Ragwulf and his son, Wulf - and she knew at once what the argument was about: Bess. It was certain to be about Bess. Scarred Maighread might be, but she could still use her eyes and ears. She had been expecting this, whilst hoping and praying it would not happen. They had enough problems without falling out with each other. She got up and, with a weary step, made her way down the spiral stair to the floor where her chamber lay. It had never really been her chamber, but one she had shared for several years with Eleanor and before that, her cousin, Joan. At the sudden memory of Joan, her hand moved unbidden to stroke the rough skin on her right cheek. She hesitated on the threshold and thought of going on down to the courtyard but instead went into the chamber, which was mercifully empty. When the dispute showed no sign of abating, she shut the door - a waste of effort since she could still hear every word through the narrow arrow loop. Maighread knew there would be a crowd of men around the pair by now. They would have stopped work on the gate to listen. “What business is it of yours if I’ve lain with Bess? We’re going to marry!” declared Wulf. “She’s not for you!” retorted Ragwulf. He did not sound angry, but wounded, almost desperate. His self-control was legendary amongst his men; Ragwulf always remained calm. Always - but not now. “This is not the place-,” said Ragwulf. For a moment there was a silence then much muttering and restless shuffling of boots on the cobbled yard until another voice was raised. Eleanor: as loud and uncompromising as ever. “You’ve been told,” shouted Ragwulf. He was hoarse; he had shouted enough last night, Maighread thought. Maighread heard the iron in his words. How hard it must be for him to speak so to his own son. Wulf must have heard that iron too for he did not reply. There was a further awkward silence and then she heard the footfalls as the knot of men and servants began to disperse about their business. She found a tear on her cheek and wiped it away. The tension was beyond bearing: too many young men, their appetites whet by the blood of war, and now they grew resentful. Some had found brief solace with local girls but there were few enough of those. Her own bitter memories seemed nothing now, lost in the general misery of a beleaguered garrison waiting in vain for its lord to return. No-one knew where he was and his exile had more than a year still to run but Maighread knew that the inhabitants of Crag Tower could not wait another year. Below in the Great Hall, Eleanor stood silently beside Ragwulf. She had come to know him so well and yet he was as distant towards her as he had ever been. It seemed that some wounds just would not heal. She could read his face better than she could read a book - though that was no great claim in her case. His eyes were fixed upon the wall; his anger had gone and his face now bore only the dark lines of regret. She touched his shoulder but he shrugged her arm away. She opened her mouth to speak but he held up a hand. “Don’t, my lady,” he said. “Don’t say a word. It’ll help nothing.” Then he turned away. He was probably right; when had she ever said a word that made things better between them? ‘Between them’? Even her thoughts threw them together, though there was a chasm there long before this morning. His bitter words cut her but he would have known that. He meant her to feel some pain too. She could not stop looking at him, waiting for him to meet her eyes but he didn’t. Instead he turned on his heel and left. She stared after him, listening to the familiar footsteps echoing in his wake. Hal was left by the well, alone. Everyone else had disappeared - most to continue repairing the gate - but he had seen his friend Wulf go to the stables, his face set in anger. He went after him and found him there brushing down one of the few remaining horses. “That’s your father’s horse,” he said softly. “You can’t leave,” Hal said simply. Hal winced. Sooner or later he had known the question would be asked. “But?” said Wulf with a rueful smile. “If you take your father’s horse, he’ll kill you,” said Hal. The following morning Hal stood in the Hall. On the small dais before him was the Elder family’s pale blue banner and beside it was Ned Elder’s great battle sword. Hal had brought it with him to Crag Tower and Lady Maighread had put it in a place of honour. Now Hal stared at it wistfully, wondering whether he had done the right thing. Wulf had gone at first light. He had taken eight men and all the remaining horses. Lady Eleanor had raged about the small castle all morning. Ragwulf had taken it in silence but his face was grey and drawn. No-one dared speak to either of them. His friend had gone but, if he was true to his word, he would be back at Lammas. Then there would be words, harsh words, and more besides. It was all so… unnecessary. Bess walked into the Hall with John toddling in her wake. She smiled at Hal and he put an arm around her. Her dark eyes were red-rimmed and her cheeks puffed. John hugged her leg and she bent down to him. “I can’t find Wulf,” said John. Hal shrugged. “Just at the moment I don’t much care what they think,” he said. He took the boy’s hand and led him out into the courtyard. Will, Lady Eleanor’s seven year old son, was waiting with his bow and arrow bag. He handed the bag to John to carry as they went out to the butts and the small boy skipped along beside them. Hal shook his head - oh, to be just four years old again. It occurred to him then that when he was that age, he still had a father and a mother. He remembered being happy. Perhaps his parents were too, though he knew now how hard life was for those who toiled on the land. At least John still had his father - if Ragwulf was indeed his father. It did not always seem so for he scarcely ever looked at the lad and there was certainly no resemblance. Whereas when you saw young Will and Lady Eleanor together, the likeness took your breath away. Will was tall, as his father had been, but he had his mother’s blood red hair. Hal was one of the few who actually enjoyed the butts for he lived and breathed archery. He could never practise enough but after several hours of watching, fetching and carrying, the novelty wore off for both John and Will. Hal decided they had been gone long enough in any case and that was confirmed when he saw Ragwulf striding through the long grass towards them. John grinned and Hal sighed in resignation. Yet when Ragwulf came up he was strangely quiet. He had taken Wulf’s leaving badly. He did not chastise Hal for taking John out; in fact he seemed almost grateful and clapped him on the back. Hal looked at him. “Harder for you to bear than me, I think,” he replied. “Best take the lad back though,” said Ragwulf and he turned to go back to Crag Tower. Hal waited for a while, watching him trudge up towards the gate. He should look like a warrior in his prime but he walked liked an old man, his shoulders hunched and his head bowed. What weight did he bear on those broad shoulders?